Fantastic 11" ROSCOE Picklock with nicely variegated horn handles that exhibit no cracks or defects other than some light scuffing. Unsharpened kris .. This is a pretty Imperial toothpick with fixed guards and rare blue and green marbled overlays that are crack and tear free. Measures 4-1/4" closed. .. This is a very nice 11" MAURO MAURO Pic in super condition. Having nice dark horn handles, with some lighter swirls, which are in great condition save.. This is one massive beast of a knife, measuring approximately 13-1/2" open and 8" closed! Marked " G.C. CO. ITALY" (Gutman Cutlery Co.) With super da.. This is a blast from the past "Hackman Finland"butterfly knife that was given to CIA operatives, I believe, in the Philippines. Measuring approximate.. Here's a nice little "Hammer Brand" marked "Imperial" toothpickk from the 1950's switchblade era. Measuring 4-1/4" closed and almost 7 -1/2" open wit.. This is a pretty decent Shrusnap fishtail measuring 4-1/8" closed and 7 -1/4" open. Nice full blade exhibits some light tarnish, Fires hard with no .. This is a pretty Imperial toothpick with fixed guards and candystripe overlays of which the rear has some staining beneath, as pictured. Measures 4-1/..
Heres a sweet little Camco "Snap-t" knife manufactured by Camillius post 1948 into the 1950's , making it a very short production run. it is a unique.. Here's a neat little unmarked "Eagle Pencil Co" gravity with embossed gold colored all metal construction. Measures approximately 3" closed and 4 -5/8.. This is an unusual mechanism for a pocket knife in which the blade is opened and closed by sliding the button without the need of any type of spring m.. It's obviously not an auto but is a really nice auto pattern, sans the spring and button. Measures 4 -3/4 closed and 8-1/4" open with killer horn and.. This is an oddball made by Boker in which the composite scale is canted to unlock the blade which is then slid into position. It is canted again to u.. UNUSUAL / RIZZUTO STYLE / Marked "BELL"
Although this knife isn't perfect, it has its merits. Being marked "Bell" makes this a bit of a unicorn, thus on the rare side. That being said, the.. This is a nice old example of a SS Jumbo jack with the rarer fishscaler blade. Measuring 5" closed and 8 -3/4" when open, this knife is a handful. Ni.. Here's a Holy Grail knife for most vintage switchblade collectors! This knife is a beast, to say the least, at 5-1/2" closed and 10" when open. Near.. This is one of the smallest Rizzys I've had the opportunity to own. Measuring 3-3/8" closed and just shy of 6" when open. Full unsharpened blade fir..
A.C. MFG.Co. / K112 / Stag Hunter / NICE! I just love this pattern. what a great knife with fantastic and perfect stag handles and what looks to be a full,untouched blade. Measuring approxima..
Heres a nice Collectible Queen cutlery Co. manufactured auto that most likely will never go into production again due to the demise of Queen. Measuri.. Here's a nice Collectible Queen cutlery Co. manufactured auto that most likely will never go into production again due to the demise of Queen. Measuri.. This is a pretty minty WINGEN leverlock measuring roughly 4" closed and 7 -1/4" opened with stunning stag handles that are perfect. Functions perfect.. This little 2-7/8" beauty is just about mint with unsharpened blades that function as when new. Stunning burnt orange celluloid handles make this kn..
What a super piece of American Switchblade Royalty. This 3-3/8" Schrade Cut Co has fiery and perfect mother of pearl handles that are not often found.. This is a pretty nice condition Presto with crack free onyx handles that have some deposits under the scales. Full blades have been used but are sti.. 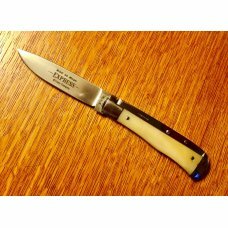 This is a nice old Schrade Cut Co double with perfect imitation ivory handles. Blades have been used quite a bit and have been nicely cleaned. Every.. This is a bit smaller size Rizzy that measures 7-1/4" open. Black plastic handles have a few scuffs and what looks like a light melt at the front bol.. This is a near mint Coricama take-apart Hobo knife from Italy. Measures 3-7/8" closed with perfect horn handles. Blades are all unsharpened near min..
What a fantastic little PBKC 3-3/8" double with scroll embossed sterling silver handles that are tight to the knife but sport some of the usual shall.. This is a neat little MY-T-MITE measuring a diminutive 2-1/2" closed. Whiteish plastic handles are scuffed and mostly nice with some.slight shrinkage.. Here's a very pretty burgundy and black Presto 3-3/8" double. Handles have no cracks but have some pin rings around several pins. Pretty close to full.. Cute / INOX / Stag Picklock / Salesman?? This is an interesting little Inox transitional probably made around 1960ish. Measuring just under 4" closed and 7" open this knife would have been p.. Here's an honest little Shursnap that Measures 4-1/ 8" closed. Yellow plastic handles have some dings, shrinkage and discoloration and could use a spi.. This is the rarest if the letter opener switchblades manufactured by any of the American manufactures because if its diminutive size and short produ.. This is one stunning knife. Measuring 8-3/4" overall this is the standard size letter opener made by Presto with the early "PAT. PEND-G tang stamp. .. This is a big old INOX Camper with a sprung clop master and 3 tools. Gnarly stag handles are stunning. full clip blade is near mint with a few scuff.. Here's a pretty rare piece that any American switchblade collector would love to have. This is a printers block used to print Case catalogs and the l.. Here's a neat little Shumate Razor Co of St. Louis MS. Stunning green celluloid handles, pearl covered tang that sports a hairline at one pin as pict.. This is an oldie. This Southing Razor was manufactured between 1867 - 1905 in Southington Conn. Slick black celluloid handles are excellent as is th.. 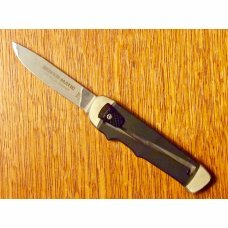 This is a nice little Presto 4-1/8" single that functions perfectly with a full and nicely cleaned blade. Stunning handles are replacements making t.. This is a fine old F Christians springer in primo condition. Knife measures 4-1/2" closed and has perfect jigged brown bone scales. Full blade has p..
Here’s a nice old New England razor circa 1890 - 1913 in excellent condition. Basic slick black handles. Full Waterville Cutlery Co / Straight Razor n..
Nice old Edgemaster 4-1/8" Paratrooper style auto with painted metal handles. Clip blade is pretty full and has been nicely cleaned. Springs out grea..
What a cute little knife. Measuring around 14 cm opened this is a little gem. Beautiful shell-wrap handles are excellent with the exception of one ble.. This is a just about minty tool knife manufactured by the Aerial Cutlery Co of Marinette WS. Measures 4-5/8" closed. Minty unsharpened clip and pen .. This is an older Cripple Creek Gunboat Canoe manufactured in 1983 by Bob Cargill. Measuring around 4" closed with three pristine blades, the master .. This is a bit of a rare piece as only 10 were made in this configuration. Pretty big for a slim coke at just over 5-1/2" closed. Red, white and blue s.. This is a bit of a rare bird. Case switchblades were made on contract by the George Schrade Knife Company or Bridgeport CT in the late 30's, 40's and.. This is a pretty nice 11" Latama Italy switchblade with a Kris blade. Blade is full but has been sharpened a bit coarsely on the very edge. Otherwise..